You will need to tickle a sleeping wall durng the game in order to awaken the giant obstacle. Once the wall has moved out of the way you can gain access to the Underground Lake area. To tickle the wall you have to tap on its body. If you tap in the right spot, the wall will smile for a moment and you'll earn 50 points. If you tap in the same spot too quickly then you'll loose 50 points. The goal is to earn 1000 points in 30 seconds. If you don't earn enough points then the wall will go back to sleep and you will have to try again. 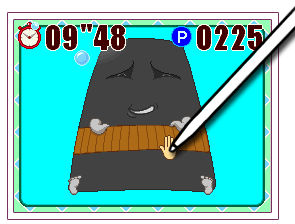 This mini game only occurs once in the game, and it can be frustrating if you don't know where the tickle spots are. So in order to earn the necessary points, tap once on one of the areas listed and then tap once on another listed spot. You don't want to tap too fast or your tickle won't register. Just tap around in a circle until the time has expired. If you earn 1000 points or more then the wall will permanently awaken and you can move on.